This week was the first week back to school. In any other year in the past, this was a happy day for me. By the end of summer you really need a brake from having kids around nonstop. But, that wasn’t the case this year. I had a great summer with the kids and I enjoyed having them around. Its sad for me to have to send them away for most of the day again. Especially now that this leaves poor Miss Kayla home with no buddies too. Dad was in Leadville with our camera for the first day of school so I only got some bad iPhone pics. 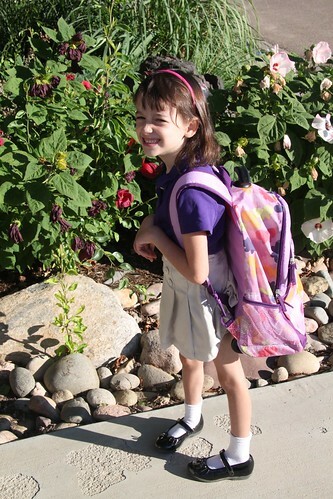 But here is Reagan on her first day of First Grade. Can you believe it! 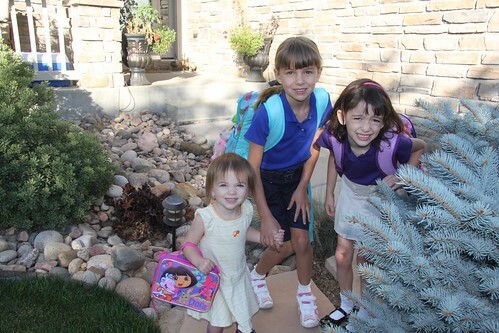 The next week Dad and camera were home so we posed for our annual school shots in the front yard. One point of excitement was that Kayla would be included in the photos this year. Her sisters were so proud of her! 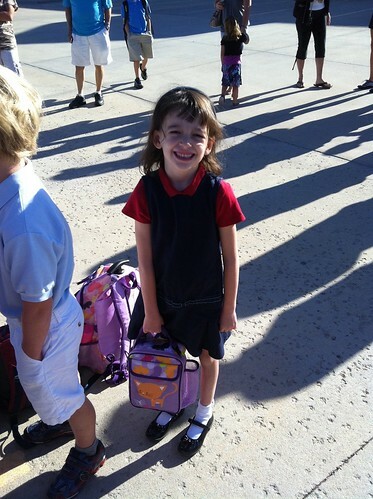 This is a monumental year for Reagan as a first grader. Not only is she now in school a full day. But, she also now gets to have other fun classes too. Music, Art, PE, and Library. I think these definitely help break up the day. Reagan knew her teacher from when Sydney was in first grade. She always thought she was super nice so she was really excited to have Mrs. Young as her very own teacher. She is great! She is having difficulty with the long day. Very tired and grouchy when she gets home. But, we’ve been through this before. I know it won’t last.